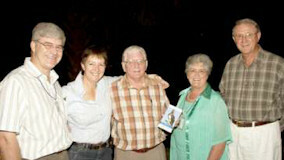 The 1969 Australian rugby touring team recently visited Naboomspruit, where they were the hosts of NOPTRU. The team decided to hold the 40th reunion of their 1969 South African tour on a second visit to South Africa, accompanied by their wives and friends. They also traveled extensively in the area and, amongst others, visited the white lions at Entabeni. 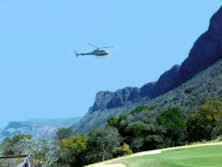 Twelve of the 30-member group opted for a helicopter ride at Entabeni and played the notorious 19th hole by lodging their golf balls from the summit of the mountain to the Africa-shaped green far below, a never-to-be-forgotten experience. At Euphoria Golf Estate and Hydro, where they stayed, many enjoyed the aerial cableway ride and the spectacular views over the area, some excellent golf and a celebrity banquet. "How are you there. I'm still fine hear at Venda. I thank you for projector but am having a little problem with it I think light is out of order but I will take it to servicing personnel. My business card is finished I ask you tou to make some for me if is possible. I think on the picture space you can use my picture and include my Email address. I ask you to pass my message to the Bird club that iam asking if one is having an old pair of binoculars...."
An appeal is made to people who would like to contribute to this empowerment project to especially send used binoculars and old nature and bird books and magazines to Bushveld Breeze at P O Box 1886 Naboomspruit 0560 for distribution to these guides. Kammaland Landgoed in die rustige Bosveld 17 km vanaf Naboomspruit bied 'n rustige en gehalte leefstyl aan inwoners wat permanent of in vakansietye van die stadsgewoel wil ontvlug na hulle eie skuilplek. Erwe waarop volgens voorskrif gebou word, en 'n beperkte getal woonwastaanplekke is beskikbaar. Kammaland Landgoed beskik reeds oor groot warm- en kouewater swembaddens, 'n kinderspeelpark, ontspanningsaal en heelwat wild soos rooibokke, blesbokke, waterbokke en bosbokke wat wild binne die sekuriteitsomheining rondloop. In 'n volgende fase word volledige sekuriteit en toegangbeheer ingestel en word 'n mini gimnasium, 'n haar- en naelsalon, 'n restaurant en nood mediese sorg beplan. Van die ontwikkelingsregte wat verkry is, sal Kammaland Landgoed slegs ongeveer 100 erwe en 23 woonwastaanplekke aan kopers beskikbaar stel. 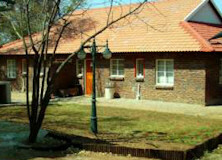 Erfgroottes vir bou wissel van 450m2 tot 625m2. Sommige erwe het pragtige uitsigte oor die Waterberge. Erfpryse wissel van R150 000 tot R350 000. Geboue moet aan minimumspesifikasies soos teeldakke voldoen. Die maandelikse heffing op onbeboude erwe is R100 en op beboude erwe R750, welke bedrag gebruik word vir instandhouding van die openbare gedeelte van die Landgoed en vir bestuur. Eienaars betaal vir krag volgens meterlesings. Eenhede kan ook in vakansietye namens die eienaar uitverhuur word. 23 woonwastaanplekke is beskikbaar teen R110 000 elk, met 'n maandelikse heffing van R100. Woonwaens kan permanent op die terrein gelaat word. Kammaland Landgoed is wettig geregistreer as 'n aandeleblokskema soortgelyk as die meeste woonstelle aan Durban se strandfront wat verseker dat die belegging veilig is. In spesifieke gevalle en waar die deposito voldoende is, bied die ontwikkelaar gewaarborgde lenings vir kopers van erwe en boupakkette aan. During 2010 Naboomspruit will hold its Centenary Celebrations. A committee is working full steam ahead on this important project. The event will also be utilised to market Naboomspruit and the area in general. Festivities will include a parade of floats, the "Windpompfees" (which is already a unique and huge established festival in its own right), various national sports events and a number of gardening, agricultural and hand craft and art exhibitions and competitions. One of the highlights of the centenary celebrations will be the launch of a comprehensive illustrated publication on the history of Naboomspruit and the area, called "'n Eeu van Genade" (A Century of Grace) by mr. Mauritz Hansen. The A4 publication of 235 pages includes 646 photographs of historical importance and 3 detailed historical maps. Herman van Niekerk and Saartjie Kidson, two prominent Naboomspruit birders, launched their second bird book in the planned series of 5 regional bird guides, at the 80th Annual General Meeting of Birdlife SA in Phalaborwa during March 2009. The Spotter's Guide to Birds of the Lowveld is a 224 page full colour pocket guide with at least one photograph of each of the Lowveld's 541 resident and 47 visiting bird species. A separate section of the book shows a number of the larger birds and raptors in flight, clearly defining their underwing patterns. The guide is simple to use with an easy Shapefinder and Dueldex index. This guide is also available in electronic format for computer, where approximately 400 of the bird's calls have been added. The electronic Bird Spotter's Guides have been hailed as one of the most innovative, informative and entertaining products that have been developed for South African birders in recent times, and proves to be very popular. 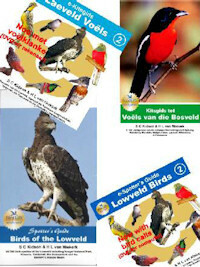 The Bushveld and Lowveld Bird Spotter's Guides, as well as the electronic bird Spotter's Guides, in separate English and Afrikaans editions, are available from the authors. A CD with 208 bird calls of the more common and melodious South African bird calls, have also been compiled by the same authors, and can be used to learn bird calls while, for instance, driving in one's car. Information to order these products appear elsewhere in Bushveld Breeze. Order now and add R30 packaging and postage to you order. All products also available in Afrikaans. Please indicate your language preference. The electronic format is the complete book on DVD with bird calls added for use on computer.